If you are searching for the best face wash for men you came to the right place. Below we review our top 6 choices for best face washes. Why should you use a face wash over a bar of soap? Normal soap drys out your skin and can actually leave it more prone to irritation and outbreaks. A facial cleanser is designed to remove dirt, oil, dead skin cells, and other grime from your skin without any harmful effects. Different products will work differently on different skin types, so you might need to try several face washes until you find one that works best for you. Whether you have normal, dry, sensitive, oily, or combination skin there are cleansers that will work for that type and many that can work on multiple conditions in one. With certain types of skin you might also need to use other products in conjunction with a face wash. For example if you suffer from dry skin, you might want to add a moisturizer or lotion to your grooming regiment. 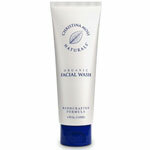 We chose the Christina Moss Naturals Organic Facial Wash as the best face wash for men. With a price of $22 for a 4 oz bottle, it is very expensive. This gentle, creamy organic face wash works amazing on any skin type, but it is especially great for guys with sensitive skin. It is designed to reduce oil build up, remove dead skin cells, and moisturize and heal damaged skin. The biggest positive of the Christina Moss Naturals Organic Facial Wash is that it contains zero chemicals, parabens, dyes, sulfates, or fragrances; and instead is made up of only 100% organic ingredients with the main ingredient being coconut oil. It does have a very slight smell due to rosemary extract. The only complaint we have seen from some people is that it does not work that well on very dry skin. Although those problems seem very rare and perhaps those people just need an additional moisturizer to help with their dry skin. The $24.95 Rugged & Dapper Daily Power Scrub Facial Cleanser is a 3-in-1 face care solution which scrubs, exfoliates, and is a toner. It comes in an 8 oz bottle which means you will pay $3.12 per oz. That is cheaper than the Christina Moss Naturals Organic Facial Wash, but still on the expensive end. Made from 100% natural and organic ingredients, it is ideal for all skin types including sensitive, acne prone, or normal. It combines a foaming action with exfoliating beads for a slightly gritty texture that will clean dirt and excess oils, unclog pores, scrub dead skin cells, and nourish and smooth your skin. This Rugged & Dapper face wash contains Aloe Vera, Vitamin C, Willow Bark, and Tea Tree Oil. It has a slight ‘manly’ scent, but it is very subtle. 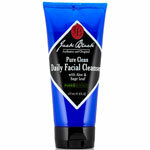 We selected the $19 Jack Black Pure Clean Daily Facial Cleanser as the best face wash for men with dry skin. This lightweight product combines a cleanser with a toner and is made with 100% organic and vegan-friendly ingredients including aloe, sage leaf, oat- and cocunut-derived surfactants, and witch hazel. These ingredients remove dirt and oil and leaves you with a clean, smooth complexion without drying out your skin more. At $3.17 per ounce for a 6 oz bottle, it is on the expensive side. There is the option of purchasing a larger bottle to reduce the price per oz. Although no chemicals or artificial fragrances are added, there is a very slight herbal scent to this Jack Black facial cleanser. We recommend using in combination with a face moisturizer if you find you still have dry skin when using this facial cleanser. 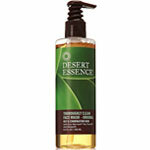 The best face wash for men with oily skin goes to the Desert Essence Thoroughly Clean Face Wash. It is also really affordable since it sells for $9.40 for an 8.5 fluid ounce bottle, which is $1.11 per oz. Through a combination of natural ingredients like Tea Tree Oil and mineral-rich extracts it cleans, removes excess oil, and soothes and restores your skin. Overall the Desert Essence Thoroughly Clean Face Wash is great for oily and combination skin, however some users with really sensitive skin have complained it is too harsh for them. It also has a slight tea tree oil smell, that while noticeable is not overwhelming. Another good cleanser for men with dry skin is the pHisoderm Deep Clean Cream Cleanser which sells for $10.25 for a 6 oz bottle, but is also available in bulk for a much cheaper price per ounce. This pHisoderm product has been around for a long time and has a long track record of people using it with an average rating of 4.6 stars on Amazon. The pHisoderm Deep Clean Cream Cleanser does not foam up and is soap-free, alcohol-free, and dye-free. It removes dirt and oils without drying skin and soothes your skin thanks to aloe, Vitamin E, and Chamomile. A lot of people say this helps clear up their acne. 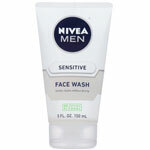 If you are looking for the best cheap face wash for men then look no further than the Nivea Men Sensitive Face Wash. It costs less than $1 per oz since a 5 oz bottle costs just $4.94. This product is intended for sensitive skin and is designed to cleanse gently without drying out the skin. It contains no drying alcohol and is enriched with Vitamin E, Chamomile, and Witch Hazel extracts which leaves skin healthier, smoother, and even softens a beard for a better shave. A lot of men use it before shaving and say it reduces razor burn, bumps, and redness. We don’t really recommend the Nivea Men Sensitive Face Wash for oily skin because it is a glycerin based product that has a slightly greasy feel to it. Buyers should also be aware that this product contains fragrance and some people have complained about the smell, but we don’t think it is too bad. Christina Moss Naturals Organic Facial Wash 9.2 $21.99 4 $5.50 Decyl Glucoside, Certified Organic Cocos Nucifera (Coconut) Oil, Certified Organic Olea Europaea (Olive) Fruit Oil, Certified Organic Helianthus Annuus (Sunflower) Seed Oil, Potassium Hydroxide (this is removed in the final product through the process of Saponification), Certified Organic Aloe Barbadensis Leaf (Aloe Vera) Juice, Citric Acid, Certified Organic Butyrospermum Parki (Shea Butter), Certified Organic Rosmarinus Officials (Rosemary) Essential Oil, Rosmarius Officianalis (Rosemary) Flower Extract. pHisoderm Deep Clean Cream Cleanser 8.9 $10.25 6 $1.71 Water, Sodium Laureth Sulfate, Mineral Oil, Cocamidopropylamine Oxide, Disodium Ricinoleamido MEA-Sulfosuccinate, Acrylates/C10-30 Alkyl Acrylate Crosspolymer, Aloe Barbadensis Leaf Juice, Chamomilla Recutita (Matricaria) Flower Extract, Diazolidinyl Urea, Disodium EDTA, Fragrance, Glycerin, Methylparaben, Propylene Glycol, Propylparaben, Tocopheryl Acetate [Vitamin E], Triethanolamine. Nivea Men Sensitive Face Wash 8.8 $4.94 5 $0.99 Water, Glycerin, Sodium Laureth Sulfate, Carbomer, Panthenol, Tocopheryl Acetate, Chamomilla Recutita (Matricaria) Flower Extract, Hamamelis Virginiana (Witch Hazel) Bark/Leaf Extract, Sodium Methyl Cocoyl Taurate, PEG-7 Glyceryl Cocoate, PEG-40 Hydrogenated Castor Oil, Xanthan Gum, Maltodextrin, Caprylic/Capric Triglyceride, Phenoxyethanol, 1,2-Hexanediol, Sodium Hydroxide, Trisodium EDTA, Benzophenone-4, Fragrance.